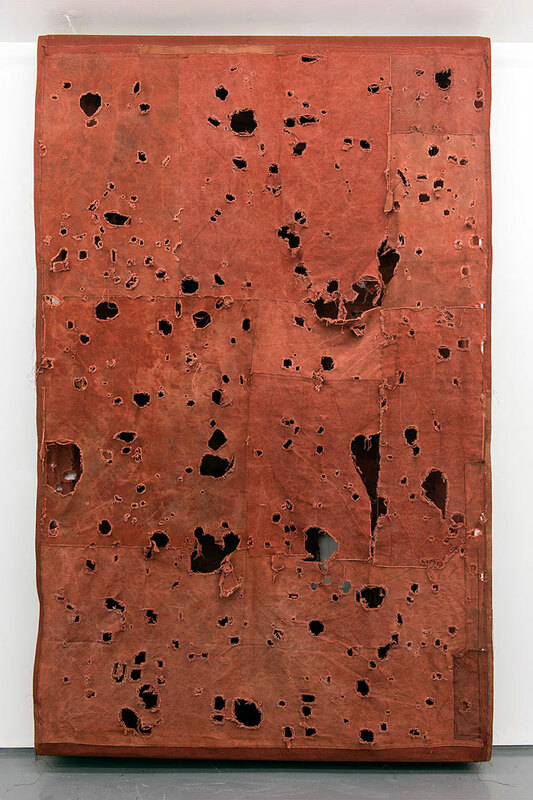 Simon Callery presents two types of paintings which – though categorisable as ‘flat’ – build up considerable interior space. The fold in the FOLD gallery comes from 125 meters of canvas rucked up to make the 75kg of Wallspine (Leaf), 2015. The other three large works are stratigraphic layerings built up at the archaeological sites which inspired them, their earthy tones considerably weathered by the practical necessity of being left out during the months of their formation on Welsh hill forts. The holes let into their inner voids are derived from the locations and shapes of artefacts found, but make, along with cutting and re-stitching, for a convincing exposure of process and excavation of painting.